We've got another odd pic for you and your captioning pleasure this week. Good luck, cheers, skoal, salut, chin-chin and all that stuff. See you back here Saturday to see who captioned whom under the table. The smartest man on the planet. Proof positive that women will do anything if you let them use your Visa card. In the Ukraine, abusing the elderly is serious business. Bjorn, of Lapland, was the only one left at closing time, so the barmaid decided to take a chance with him--She obviously had some catching up to do. Joe refuses to carry Mom's beer as a matter of principle. 20 year olds will do anything (or anyone) if they only buy for them! I'm sorry. Is there a problem with this picture? What am I missing here? "Ma, if you don't take this six-pack right now, I'm dropping it." Just another cougar helping her cub. Edna and her boy toy prepare for tonight's celebration. "O.K. But ...Next time I get to wear the Mom jeans and you get to carry the crate"
What do you think "Sans Alcool" means? "What's more important, love? 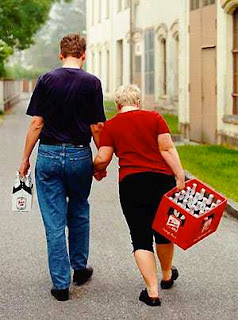 Me holding all the beer in both hands to look like a gentleman OR me holding your hand lovingly and being a gentleman?" Who says chivalry is dead?! Don't judge me! She's carrying the lite beer!! Love means never having to carry the heavy crate. "Mama's got her some strong arms and a hefty arse for balancing, just like that new First Lady we gots." It just goes to show,that a man will work from sun up to sun down,and a womans work is never done. Yep, the missus always could hold her beer better. See? I told you if lesbians are allowed to marry they will take all our lager. Silvia was going to need a lot of liquid courage to get through the night.